For the village in Iran, see Mudi, Iran. For the town in Nepal, see Mudi, Nepal. For the language, see Koda language. Not to be confused with Mudie. 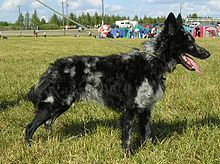 The Mudi (in Hungarian, the plural form of mudi is mudik) is a herding dog breed from Hungary. It is closely related to the Puli and Pumi, from which it was separated in the 1930s. Today, the Mudi is bred for work, sport, companionship, and show. They continue to be used in herding, as well as participating in a variety of dog sports. Mudi usually weigh 18 to 29 pounds (8.2 to 13.2 kg) and stand 15 to 19 inches (38 to 48 cm) high at the withers. The coat is medium wavy or curly, with short hair on the face and legs. The accepted colors are black (fekete), brown (barna), white (fehér), Fawn (fakó), Ash (hamvas), and Cifra (marbling of black and gray.) Mudis are born with various lengths of tails from bobtails to long full length tails. Dogs born with short or natural bobtail will be indicated on the FCI pedigree as docking is prohibited. The Mudi is a versatile farm dog that can hunt, exterminate rodents, and act as a capable herding dog and flock guardian. They are great for alerting and protecting their home and family. They have a high pitched bark and can be very loud. There are three herding dogs native to Hungary: the Puli, Pumi and Mudi, all having similar characteristics. The Mudi is a clever, keen, active dog who becomes very attached to its owner and family. The Mudi may be aloof with strangers and early socialization is recommended. The Mudi is a very active breed. They need to be taken on a daily, long, brisk walks or jogs. In addition, they will benefit from a large safe area where they can run free. They need a lot of running and other exercises to be in good condition. They love to play and will excel in all kinds of dog sports such as Frisbee. The Mudi can compete in dog agility trials, obedience, Rally obedience, Schutzhund, showmanship, flyball, tracking, and herding events. Herding instincts and trainability can be measured at noncompetitive herding tests. Mudi that exhibit basic herding instincts can be trained to compete in herding trials. The Mudi can live in an apartment if it is sufficiently exercised. However, they need space to run and play and are more suited to a larger space. They are moderately active indoors and will do best with at least a large yard. This breed can live outdoors. About 13–14 years. Although, two Mudis in Canada lived to 17.5 years of age. 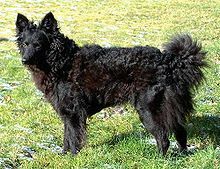 ^ "Mudi Breed Information". Vetstreet.com. Retrieved 11 December 2017. ^ "Mudi History & Training/Temperament". Akc.org. Retrieved 11 December 2017. ^ "Mudi - Royal Canin". Royal Canin. Retrieved 25 September 2015. Wikimedia Commons has media related to Mudi. "* Mudi (Dog) - Definition,meaning - Online Encyclopedia". En.mimi.hu. Retrieved 11 December 2017. "Mudi Dog Breed Information". Akc.org. Retrieved 11 December 2017. "Mudi Breed Information". Vetstreet.com. Retrieved 11 December 2017. This page was last edited on 13 December 2018, at 05:08 (UTC).